Hi, so here comes the 1st review of cotton pads. I have listed out all the cotton I have on hand HERE, and in this post I'm going to talk about the Muji unbleached one. 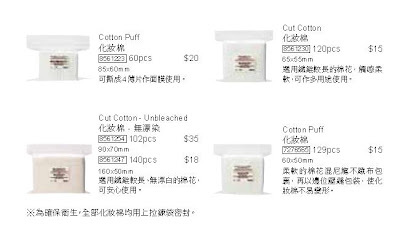 On the Muji Hong Kong website, I found the cotton description below. They offer 3 types of cotton - Cotton Puff (with stitches or pressed edge), Cut Cotton (loose layer of fibres) in white and unbleached, 2 different colours. 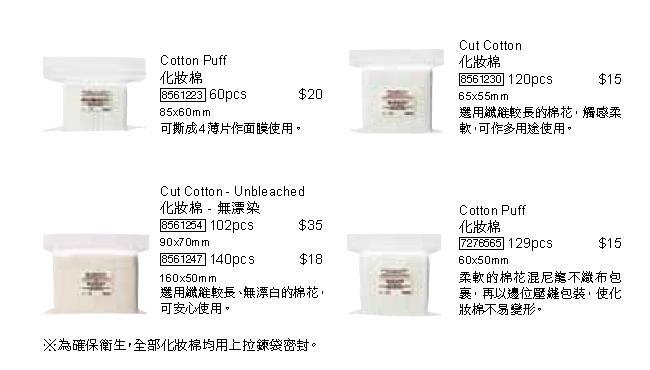 Except for the size and quantity, are Cotton Puff ($20 for 60pcs) and Cotton Puff ($15 for 129pcs) different in texture or build? Not for applying lotion - lose its shape too easily. Not for removing make up or nail polish - soaks up too much liquid. NO - Because I don't do lotion mask enough to justified this purchase.